Synopsis: After being pardoned by the President of the United States, Reggie lives a comfortable life at Camp David, enjoying pizza and telenovelas. 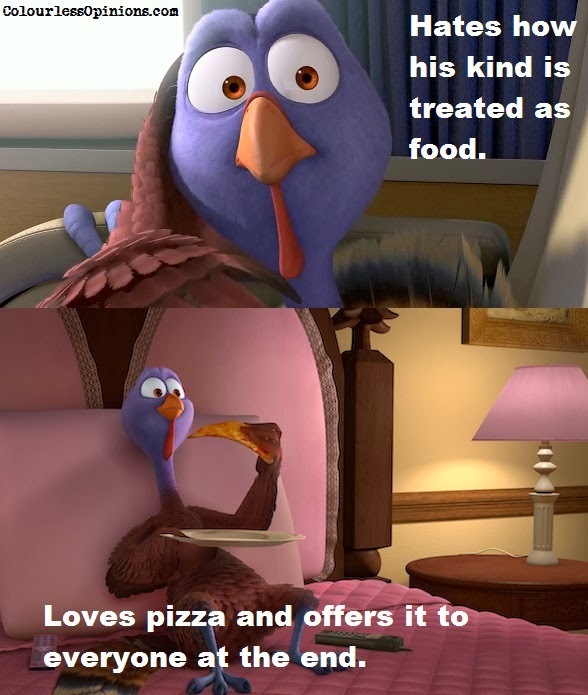 On the other hand, Jake is the president and the only member of Turkeys Liberation Front. After initial rivalry and Jake bag kidnapping Reggie, they team up and hijack a time machine in a government lab and travel back in time to the first Thanksgiving to prevent turkeys from becoming the traditional holiday meal. Verdict: The trailer shows promise, the time-travelling turkey premise seems amusingly intriguing, there’s George Takei’s voice… but sadly the film turned out utterly disappointing, long commercial for Chucky E. Cheese’s pizza. 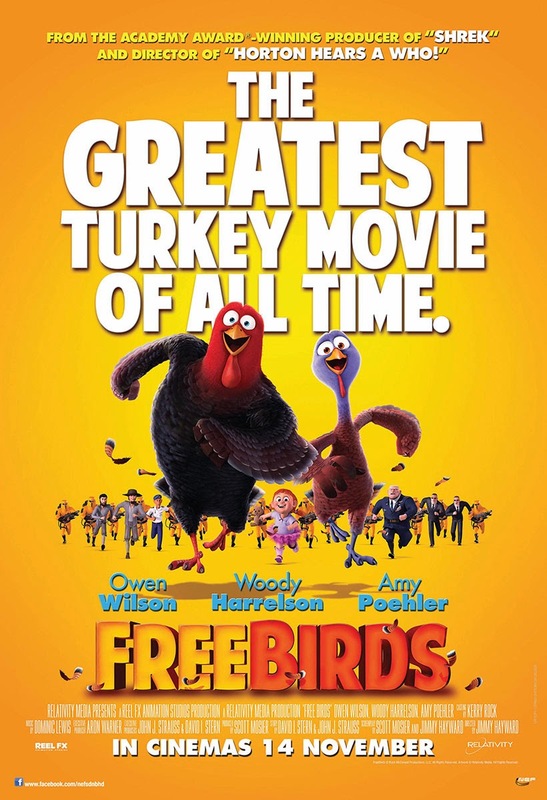 Free Birds is a highly nonsensical animation with unimpressive CGI and not enough to laugh about. Its silly slapstick humour has its very few moments but the repeated gags and tiring references of classic films totally did not work out at all. Despite being a comedic cartoon, the plot holes and messiness towards the end cannot be unaccounted for. It lacks of an inspiring moral message as well (besides anti-animal abuse), which gives me practically no reason whatsoever to even recommend it to children. Simply put, it’s just boring and has no heart. Second opinion: My girlfriend thought that it’s a passable cartoon and the art direction is cute. 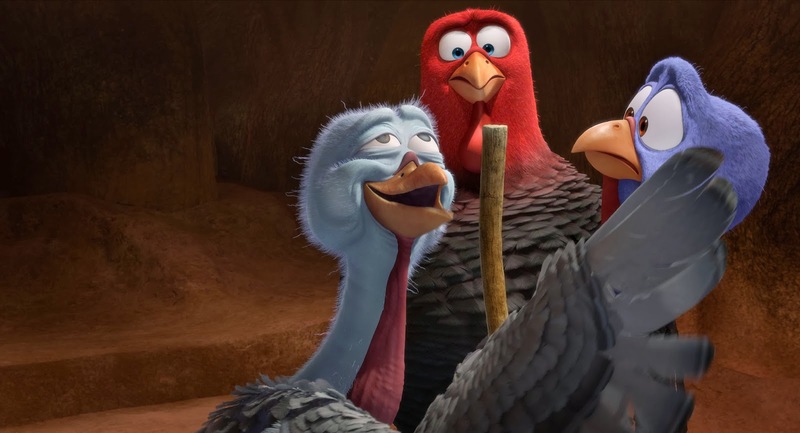 It is quite smart how the stupidity of present time turkeys are explained but it is not explained why Reggie (Owen Wilson) is so much smarter than all others. Humans cannot communicate animals in the story, which is realistic, but then nobody finds it strange that Reggie can enjoy television, understand English, able to use the remote control and order and eat pizza like a human being. When Reggie and Jake (Woody Harrelson) in Steve the egg-shaped time machine (George Takei), Jake tells Steve to travel back to the first ever Thanksgiving but Steve brings them to 3 days before it happens, how convenient for the story to needlessly develop. Jake causes many turkeys to needlessly die but does not use Steve to travel back in time to prevent it from happening. Heck, he could’ve even travel back in time to free his family from the fattening facility but nobody suggests him to any of that. There’s one unnecessary scene towards the end where Reggie meets with a few other Reggie’s from the far future but all of them seem to not know what’s about to happen. Then in the mid-credit scene, Jake goes back to the past implying that what they did may have caused a stir in the future. If whatever they do in the past affect the future, why do Jake and Reggie still exist? Why do any of this still happened? Wow, I believe no other time-travelling film has such dumb loopholes, ever. The writers of this film are obviously not capable enough for the time travel genre. Malaysian censorship: Classified as P13, understandably so, but nothing is noticeably cut. Stay tuned to my Facebook, Twitter and Instagram for updates.